Last week, we indicated that there are a number of risks involved with accepting a printed document at face value. What follows are some visual examples of those pitfalls. 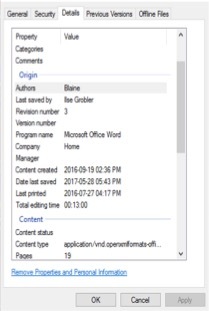 The below document represent the properties of a specific word document: This particular set of properties are derived from a Windows 10 Operating system, with word 2016 installed. At face value, it appears that the document was created on 04/05/2010 at 11:38 AM. However, from this document alone, we cannot establish whether the document was created on the said time and date as there are a number of variables to consider. Depending on your operating system and word version, different programs will indicate either last saved as/ last modification date. 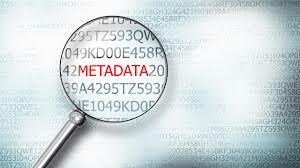 From the above, you could see that there is a lot of Metadata in a document. To reach a conclusion from the word document alone, will be unwise. The reason for this is, that a person can manipulate the date and time by setting the date and time back, or with the use of a third party application. 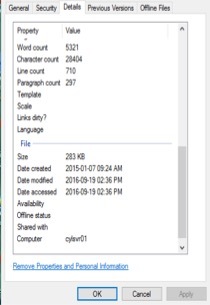 Below is an example of a screenprint of the same document from the same device but one containing the device property terminology and dates and the other the document terminology and dates. Note the different dates, which could all impact on the veracity of the document and some uncomfortable cross examination if your witness is not prepared to explain the different property sources. Contact your digital forensic expert to assist in analysing documents handed too you as evidence.